Forty-five years ago this month, six youngsters from West Philadelphia held a public screening of a short autobiographical film. This may not seem remarkable in the age of YouTube, but their 16mm home movie, Not Much To Do remains a fascinating document, and a testament to the power of community partnerships to amplify the voice of the city. In 1966, Robert D. Stoddard, a recent graduate of Princeton Theological Seminary and assistant pastor at Tabernacle Presbyterian Church in West Philadelphia developed a film club for the local children who attended Tabernacle's Christian Education class. Stoddard's initial notion was to have the children film adaptations of Bible stories, but a professor at the University of Pennsylvania's Annenberg School of Communication, Sol Worth, advised him to let the children simply roam with the camera. With funding from the Board of Christian Education and from the Presbyterian Women's Thank Offering, six youngsters--Barry Griffin, James Lucas, Ronald Mapp, Luerell Mapp, Michael Watters, and Howard White--were taught to shoot, develop and edit film. An Annenberg student, Ben Achtenberg, served as director. The boys continually talk about getting caught--while climbing around in the abandoned firehouse, while scrambling down the banks of the Schuylkill, while sneaking into the Wistar Institute. But the city itself appears largely deserted, and the only figures around to assert any authority are rumpled-looking beat cops. Coming in the wake of Philadelphia's 1964 Columbia Avenue riots, the film treats the police department's reputation for brutality as the stuff of fairy tales. "Not Much To Do" premiered at the Annenberg School on Monday, November 14, 1966. The Philadelphia Tribune envisioned it as the work of skilled social satirists: "the half-hour documentary film takes pot-shots at the City for failing to provide adequate recreation facilities for youngsters, and at police for intolerance and lack of understanding. "2 Rev. Stoddard partly reinforced this view, emphasizing the inaccessibility of the nearest gym, at the Drew School at 38th and Warren. The film was received affectionately at Annenberg, and six copies were prepared for distribution to schools and church groups. Two of those copies are held here at PHS, along with clippings collected by Rev. Stoddard. With assistance from NFL Films, we've transferred the film to DVD-video and MPEG-4 formats. Watch this space for more news about Not Much to Do. 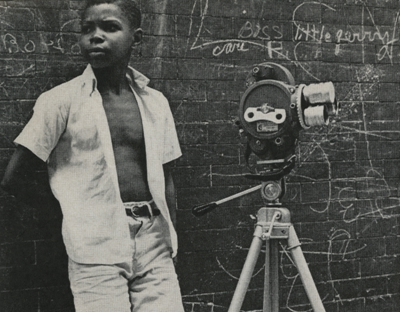 Luerell "Duckey" Mapp, with camera, 1966. 1. Ikeler, Bernard. "Tom Sawyer in the City," Presbyterian Life. February 15, 1967. p. 41. 2. "Six Teenagers 'Shoot' Movie Rapping City, Police, Recreation Dept.." Philadelphia Tribune. Nov. 12, 1966. p.2. 3. "Six Boys Film a Picture That 'Had to End Tragically,'" Philadelphia Evening Bulletin. November 15, 1966. p.22. 1 hour 27 min ago. Happy #EarthDay from the Presbyterian Historical Society! Here is an image of the very first Earth Day in 1970 that comes from our collection of Religious News Service photographs. To view this image and read about the Presbyterian Church and it's involvement in environmental causes over the years, visit https://buff.ly/2GznHvN.